Growing up, my family and I spent every single Christmas with my extended family in Birmingham. We had a very set tradition (something we called our “Progressive Christmas”) and visited with tons of family in the days leading up to Christmas, and then traveled to three locations on Christmas Day itself. To many people it seemed busy, but we wouldn’t have it any other way. We got to see so many special people, have delicious food at each stop, and we Swindles were together the whole day. But things change, and these days we’re spending Christmas in Atlanta (where my parents live) as opposed to Alabama, so over the past few years we’ve been busy creating some new traditions. 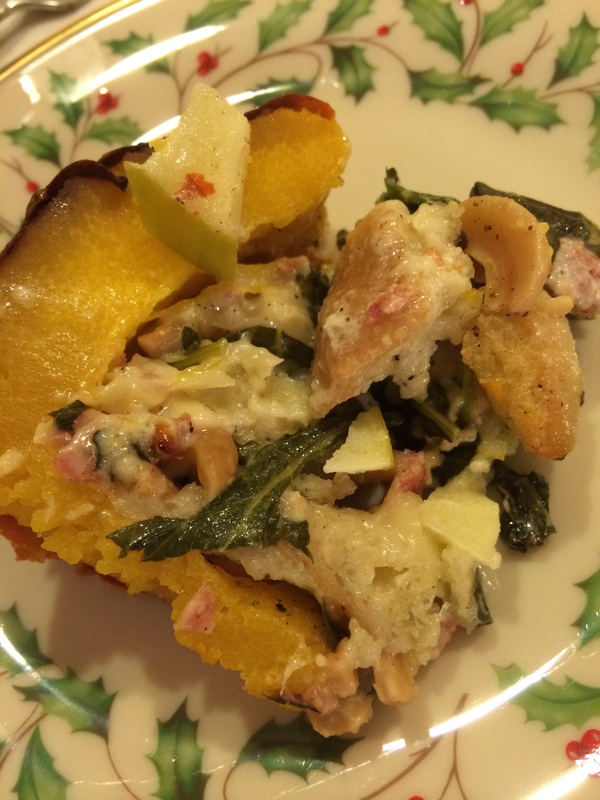 It’s been a fun process, and by far our favorite new tradition so far is a dish we enjoy as an appetizer before opening gifts: Pumpkin Filled With Everything Good. The inspiration for this new tradition came courtesy of NPR via a report that my mom and I both heard back in 2010. The report talked about the concept of filling a small-ish pie pumpkin with, well, lots of good stuff and baking it, roasting the pumpkin itself along with its contents. 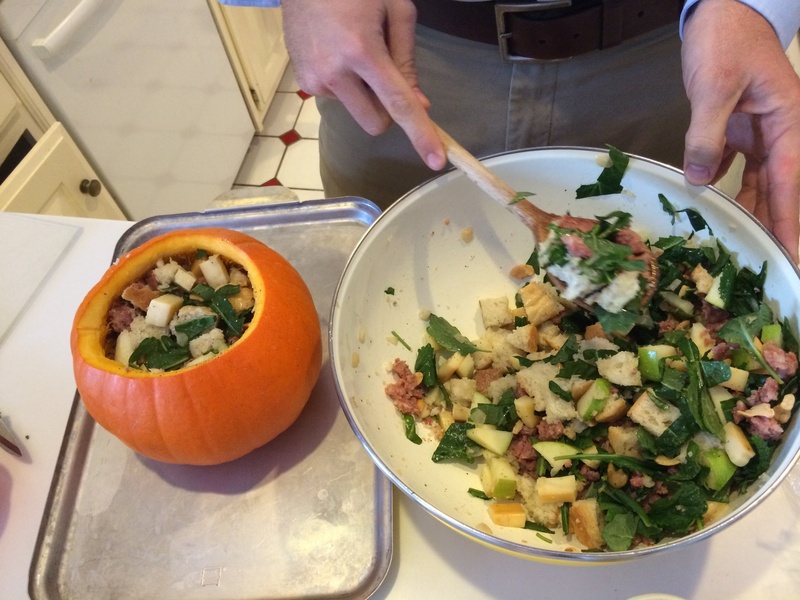 Then when it’s time to enjoy the dish, you cut slices of the pumpkin to serve with the filling. We’ve made this at the Swindle house for the past three Christmases now, so we’ve decided that it’s definitely a tradition at this point — and one we’re all excited to add to the roster. We’ve mixed up the filling from year to year, but this time was our favorite by far. Preheat the oven to 350 degrees and line a baking sheet with parchment paper or a Silpat. Channel your jack-o-lantern carving skills and cut the cap off the pumpkin and set aside. 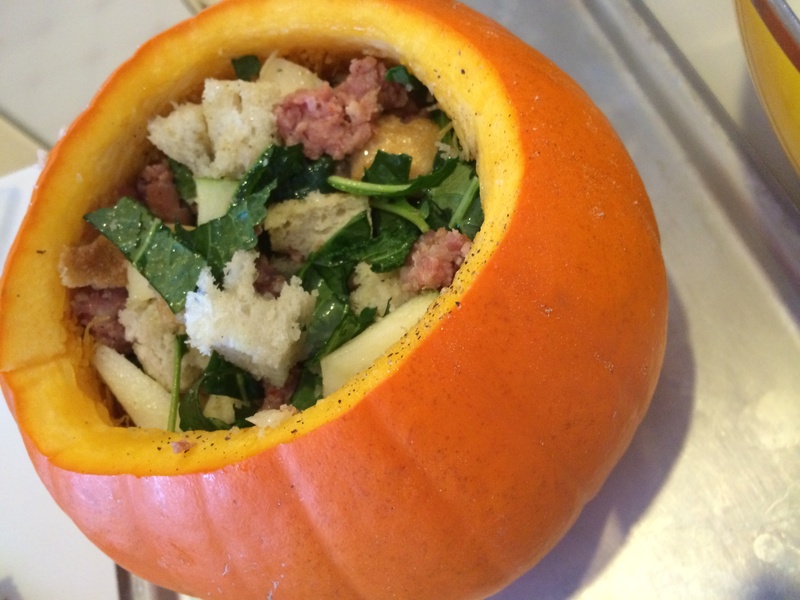 Remove the seeds and stringy interior from the pumpkin and discard. Put the pumpkin’s cap in back place and bake the pumpkin for about 2 hours, or until everything inside the pumpkin is bubbling and the flesh of the pumpkin is tender enough to be pierced easily with the tip of a knife. It’s a good idea to remove the cap during the last 20 minutes or so, so that the liquid can bake away and the top of the stuffing can brown a little. Slice into the pumpkin flesh to create a serving containing both roasted pumpkin and the filling, and enjoy immediately. Next Next post: Y’all: Winston-Salem’s Getting Awesome!